Now that the East Coast Rail Link (ECRL) is back on track and running through Putrajaya as one of its 20 stops, the federal administrative capital is set to be a rail hub, The Star reports. This will be even more so if the Kuala Lumpur-Singapore High Speed Rail (HSR) project is successfully renegotiated and comes back to life – the original plan had Putrajaya as one of the stops. Currently, the city is connected to the KLIA Express Rail Link (ERL), while the MRT Sungai Buloh-Serdang-Putra­jaya line is under construction and is expected to start operating in 2022. 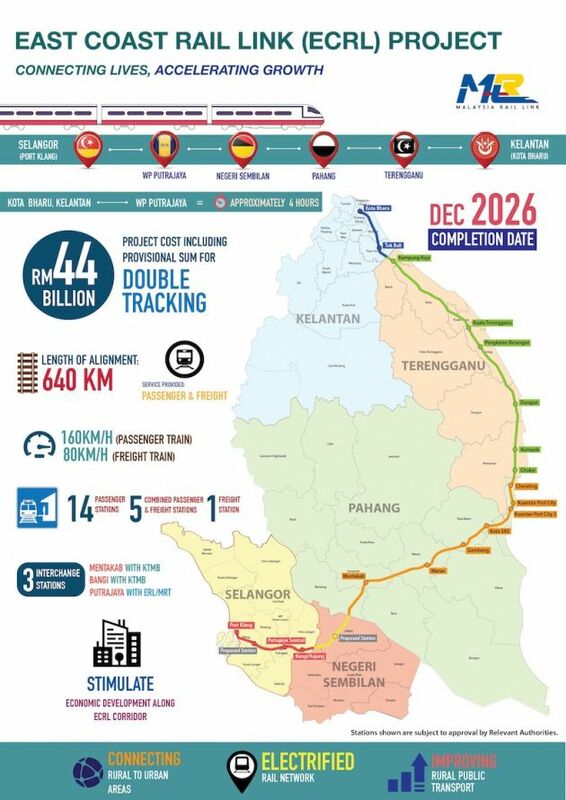 The ECRL is scheduled to be completed by the end of December 2026. “This will improve passenger connectivity to other parts of the peninsula’s west coast as well as provide direct link to KLIA. This is a significant improvem­ent to the single interchange via LRT in the integrated transport terminal in Gombak as per previous arrangement,” said prime minister Tun Dr Mahathir Mohamad. It was also reported that there are plans to revive the abandoned Putrajaya rail link project and extend it to the Kajang MRT station. The new and shorter 640 km ECRL route does not bore through the Klang Gates Quartz Ridge in Gombak. From Mentakab in Pahang, the new route goes south into Negeri Sembilan (a new addition, making it five states plus Putrajaya) before heading to Port Klang via Bangi/Kajang and Putrajaya. The original route was a more direct route through the main range via Bentong and Gombak, after Mentakab. The government described the new route as a land bridge between the ports in Klang and Kuantan. On April 12, Malaysia Rail Link (MRL) and China Communications Construction Company (CCCC) signed a supplementary agreement that paved the way for the resumption ECRL project, which was suspended when Pakatan Harapan came into power. The cost is now RM44 billion, which is a reduction of RM21.5 billion or 32.8% from the previous total of RM65.5 billion. The cost per kilometre is now RM68.7 million, compared to the previous RM95.5 million, the government said. Both MRL and CCCC have agreed to form a 50:50 joint-venture company to manage, operate and maintain the ECRL rail network. “CCCC will provide technical support and share the operational risk after the project’s completion. In addition, Malaysia can also leverage on CCCC’s expertise in operation and maintenance, hence improving the long-term viability of the project,” Mahathir said. Also, the percentage of local participation in ECRL will be increased to 40% of the civil works, from the original deal’s 30%. Work on the ECRL will begin as early as next month, subject to approval from authorities. The estimated date of completion is now at the end of December 2026, compared to the original June 2024 target. omg! should have bought a unit or 2 at putra & cyber. ish. wasted my money on bentong land. Interesting. How does a freight train line passing by Putrajaya will benefit investing there? If you had bought land in Bentong, you should have been rolling in Musang King cash. So I wonder, did you really have Bentong land? Fret not. We actually paying Axia money now to buy a Civic. The cost per kilometre is now RM68.7 million, compared to the previous RM95.5 million. The problem is we want Civic features not Axia basic features that are too useless for our needs. If it is useless to our needs (fastest way to transport freight and goods to Port Klang), why bother spending money at all? Better to spend more money for the features (more direct route) that we want. is it normal for high speed train to have many stops/stations? anybody have experience with hs train in japan or france? in japan or france. From Putrajaya interchange, swap from ECRL to HSR all the way to Islandar. i’d say this an Awesome job well done by our Govt. He was not talking about the ECRL. If you have read the article, it mentioned about HSR as well. i’ve travelled on the Thalys line from Amsterdam to France, as well as Shinkansen from Tokyo to Osaka. As a matter of fact the thalys line we were on stopped in Belgium for a fair bit. it is normal indeed. A train does not have to stop at all stations. Some express ones would bypass some stations, some makes more stops than the others. TGV from Paris-Zurich and Paris-Geneva also made several stops in between but at long stretch can briefly reached 300 km/h. ECRL with max speed of 160 km/h also only applies to long stretch between stations in east coast. Why Putrajaya and not KL Sentral which rightly is the hub of rail at the moment? There is NOTHING in Putrajaya to benefit putting a rail hub there. It is so far away from the City Center and from any other interests to private sectors. So for godsakes WHHYYY?!?!?!?! KL Sentral is already crowded. Even MRT only pass nearby. 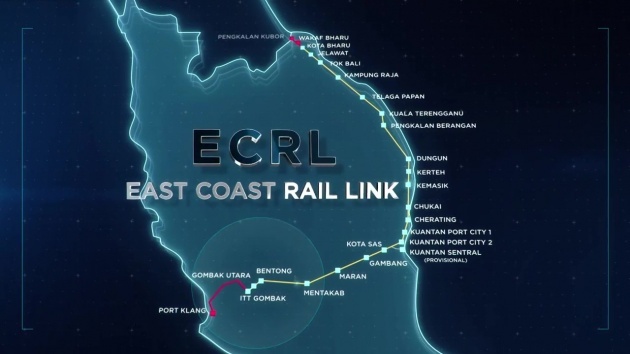 Original ECRL route connection is only in Gombak. It’s better now. Can still be expanded if it goes underground. Cost cutting ma, underground more expensive to construct..
kl sentral very jam pack already. better channel east coast rakyat to stop at putrajaya. Why do they want to stop at Putrajaya? Everyday commute to work from Kota Baharu? Are you serious? Let’s hope this Government gets changed before the realignment is permanent. I hope the next Government can stop these nonsense and go back to the original alignment plan. This is a freight line not a sightseeing Cuti-Cuti Malaysia line! Freight and goods movement are primary. They should get their priorities right. ECRL 2.0 is not serving the primary role. Doesn’t the ERCL 2.0 still makes its way to Port Klang. Dont c any problem for 2.0 for serving more ppl n at the same time Freight between ports..
What is most important to logistics and freight transportation? TIME & COST. If it takes more time to make a longer, costlier trip to Port Klang, it will not be favoured by transporters and haulers to use ECRL 2.0. Do we want this project to succeed or not. From what I see, the powers-that-be are aiming for the latter. From Port Klang to Mentakab, how long original route vs new route? I’m yet to see any calculation for objective reason. Previous story was selling out to China for RM55Billion. Now apa cerita, we are selling to China for RM44Billion? Why are we so kind to sell out and give them an RM11Billion discount? Does any of our Ministers knows how to do their jobs?! U wan giv free free RM21Billion to China Bank in compensation for termination of this project’s contract or continue the project with a lower cost?? If ur wiser than the ministers then what is ur suggestion instead? Go back to the original plan. Make the Chinese foot the RM55Billion bill instead of giving them an RM11Billion discount. How does that sound? Doesn’t take a highly paid minister to think about that. Bro do you understand who is buyer and seller? We are the buyer and the chinese are the seller. As a buyer, are you willing to pay RM55B or RM44B to get the job done? Then I ask you, do you know who is the buyer and who is the seller? If we are the buyer, how come we are selling out to China as PH has kept repeating? If we are the seller, then why are we willing to sell at RM44Billion and not at RM55Billion to get the job done? Nobody seem to be answering this question but with no answers. LolwhuT? That leaves only putra heights and shah alam to klia or putrajaya link that is missing to make it a true hub linking everything in the klang valley to klia. we need to change at Kajang or Gemas to go to the east coast. Changing somewhere in KL (Our old iconic National Railway station?) would ensure that passengers will be able to reap better the ECRL project. It is perfect for freight but needs KL to be perfect for everyone. This is the only one time we have to think the best way to connect East coast and West coast with KL. Singapore is better connected to the East coast then KL in the sense that you do not need to wait at “1 am” at Gemas if you want to take the jungle train to the east coast. KLIA is nearer to Putrajaya Cyberjaya than KL. That is why now earl station also near Putrajaya. Who knows in future with the combination of Putrajaya and Cyberjaya to become PutraCyberjaya…might replace KL to become the capital city of Malaysia. Many civil servants are from east coast states but they would be crazy to ride a 4hr train journey just to commute to work everyday. FYI those civil servants normally gets accommodation or living allowance to stay nearby their work location. I don’t think you know how civil servants operate. How about run the alignment further south to KLIA and built an ECRL station in KLIA before turn toward north-west to Port Klang.